It's 14 years since one man decided he was going to organise a weekly running event in his local park, free and open to everyone to take part. Now, more than a million people across the world lace up their running shoes and head out every Saturday to race in a Parkrun. 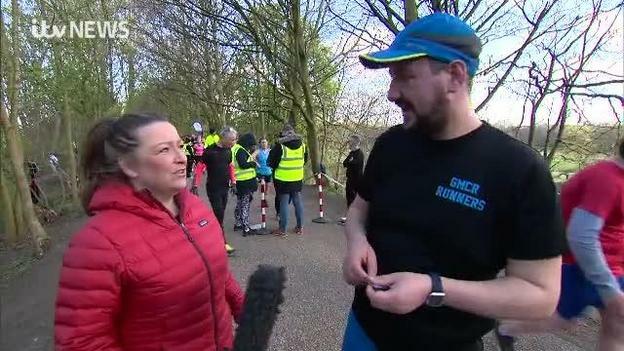 As part of our series Spring into Action, Teresa McMahon went to her local park in Salford to see just what gets runners out on a weekend. If you're familiar with photo-sharing social media site Instagram, you'll know that there's no shortage of young, beautiful people flaunting glamorous lifestyles and giving the rest of us tips on healthy living. So it's great to see the grandad from Lancashire doing so well. David Cookson's Instagram account has gone viral after his posts on weight-loss and healthy eating were shared across the world. As part of our new series Spring into Action, our reporter Teresa McMahon went to meet him. Veterans gathered in Manchester's Piccadilly Gardens today to protest the prosecution of a retired soldier for a killing in Ulster. The unnamed soldier, known as Soldier F, is to be charged with murdering two people after troops opened fire on civil rights demonstrators in Londonderry in January 1972, on what became known as Bloody Sunday. The protest was planned to coincide with a demonstration by veterans in London. Passengers on Manchester's Metrolink are puzzled today - after some of the busiest tram stops were renamed after popular computer games.